A landslide is defined as the movement of a mass of rock, debris, or earth down a slope. Landslides are a type of "mass wasting," which denotes any down-slope movement of soil and rock under the direct influence of gravity. 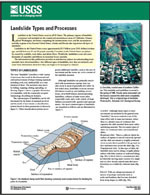 The term "landslide" encompasses five modes of slope movement: falls, topples, slides, spreads, and flows. These are further subdivided by the type of geologic material (bedrock, debris, or earth). 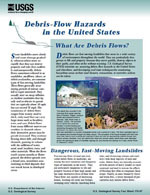 Debris flows (commonly referred to as mudflows or mudslides) and rock falls are examples of common landslide types. Almost every landslide has multiple causes. Slope movement occurs when forces acting down-slope (mainly due to gravity) exceed the strength of the earth materials that compose the slope. Causes include factors that increase the effects of down-slope forces and factors that contribute to low or reduced strength. 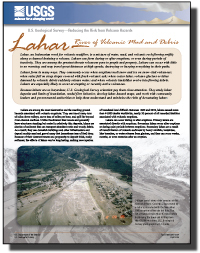 Landslides can be initiated in slopes already on the verge of movement by rainfall, snowmelt, changes in water level, stream erosion, changes in ground water, earthquakes, volcanic activity, disturbance by human activities, or any combination of these factors. 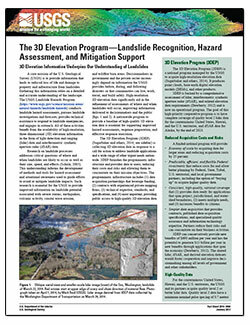 Earthquake shaking and other factors can also induce landslides underwater. These landslides are called submarine landslides. Submarine landslides sometimes cause tsunamis that damage coastal areas. 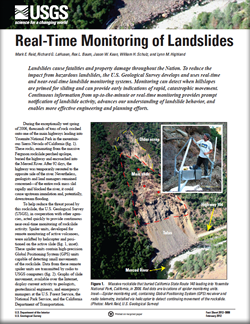 Reid, Mark E.; LaHusen, Richard G.; Baum, Rex L.; Kean, Jason W.; Schulz, William H.; Highland, Lynn M.
Real-time monitoring of landslides; 2012; FS; 2012-3008; Reid, Mark E.; LaHusen, Richard G.; Baum, Rex L.; Kean, Jason W.; Schulz, William H.; Highland, Lynn M.
Logan, Matthew; Iverson, Richard M.
Logan, M., Iverson, R.M., and Obryk, M.K., 2018, Video documentation of experiments at the USGS debris-flow flume 1992–2017 (ver 1.4, January 2018): U.S. Geological Survey Open-File Report 2007–1315, https://doi.org/10.3133/ofr20071315. Highland, Lynn; Ellen, Stephenson D.; Christian, Sarah B.; Brown, William M.
The Mud Creek landslide on California’s Big Sur coast keeps eroding. USGS scientists analyzing before-and-after air photos have calculated the size of the May 20 landslide on California’s Big Sur coast, about 140 miles south of San Francisco. Two snapshots from Landsat show the extent of a landslide in an Alaska National Park. Floods, coastal erosion and heavy precipitation aren’t the only predicted consequences of the El Nino phenomena. 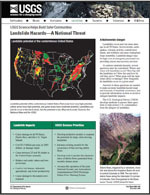 Landslides and debris flows could happen in areas where intense rainfall occurs. Big Sur Landslide fly around from May 27, 2017, a preliminary computer animation. The slide created roughly 13 acres of new California land. USGS air photo of the Mud Creek landslide, taken on May 27, 2017. Photograph showing landslides covering State Route 1 near Ohau Point. The route was impacted my several landslides and is the main north-south highway on the eastern part of the South Island of New Zealand. 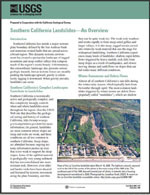 This landslide occurred at La Conchita, California in 2005. Ten people were killed. Laser scanning the entire Cleveland Corral landslide from across the valley during an active spring (2010). Repeat scans are used to detect movement throughout the slide. What is a landslide, and what causes them? Photo 1: Aerial view of the Mill Creek landslide blocking Highway 50.